Weeknight dinners at our house are usually somewhat healthy and definitely quick. With both of us working late I want something that will be ready in 30 minutes from start to finish. But I also don't want to give up quality. One night a week we usually make some sort of vegetarian pasta. This sort of dish is easy to put together, tasty and good for you. You can change the recipe according to the vegetables you have on hand. Black Olive, Mushroom and Basil Pasta. 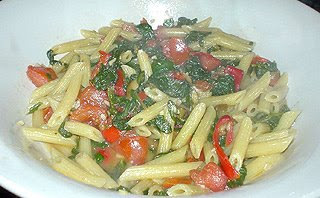 Boil water in a large pot and cook pasta until al dente. In the meantime heat olive oil in a large pan, add garlic and mushrooms saute until softened. Add kalamata olives and toss lightly to heat. Season with salt and pepper. Drain pasta and reserve some cooking liquid. Pour pasta and reserved liquid into pan with olives and mushrooms. Toss to coat. Sprinkle with basil and serve. Both pasta dishes should be served with some fresh grated Parmesan cheese. I'm going to submit these to Presto Pasta Nights hosted by Ruth over at Once Upon a Feast. Stop by next Friday and check out all of the delicious pasta dishes that have been submitted. Or better yet submit one yourself! They both look really good, the olive one is calling out to me! Both of those look so yummy! I'll definitely be trying them. Thanks for sharing the recipes! Both looks wonderful. I think I'll start with the Olives, Mushrooms and Basil first. Both looks good! So I am not choosing, I shall just eat both of them ha! ha! I love quick and easy dishes. Those both look great! Both of these look delicious, my fave is the first one. Great choices.